RSPro are manufacturers of aesthetically functional SUP accessories. The brand’s add ons are designed to bling up your sled with purpose. Having used RSPro’s rail saver tape in the past we were keen to check out their latest product – HexaTraction. For those needing to add grip to sections of their SUP, or indeed the whole deck, wax has been the go to product for many years. Unfortunately wax does tend to wear down and require a new coat every so often. Plus, it’s not the most visually pleasing. HexaTraction addresses both these issues. Looking proper pucka as symmetrical hexagonal sticky patches HexaTraction is an easy way to pimp your ride while adding much needed grip to slippery areas. 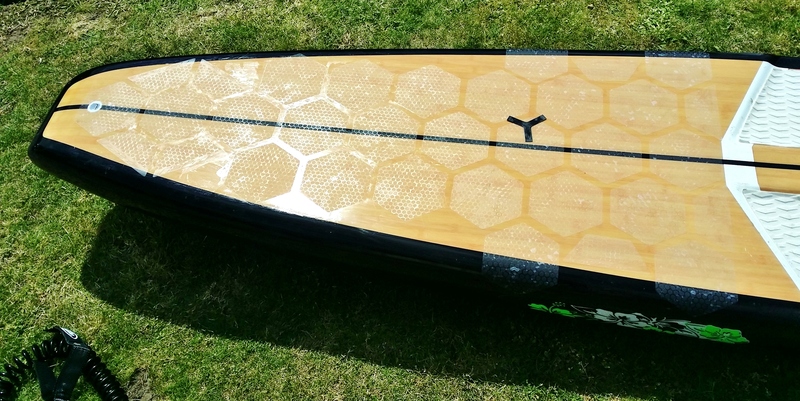 You can use HexaTraction on almost any type of board (surf and SUP). We chose to add the sticky patches to our race sled which has an aft section requiring non-slip. Coming supplied with a nifty spacer, to help with application, it’s a fairly quick job to add the traction and do so without making a mess. Paddlers can add patches in standard form or experiment with their own design – which we did a little. So what about on the water? Well, HexaTraction proved to be a super grippy surface to stand on. It’s an unusual feel compared to traditional wax as there’s almost nothing there. As soon as required, however, the sticky surfaces grips like stink and provides an efficient way of keeping glued to your board. Just to be sure we swapped back to a waxed SUP during testing and we have to say there’s no comparison. As long as you’ve laid down adequate coverage there’s really no need to revert. HexaTraction is a beautiful looking product that takes the traditional need for grip, turns it on its head and delivers something altogether different but no less efficient. Having stuck down each patch in your required design it’s onto the water. There’s no need to swap out the grip again and in our opinion HexaTraction does away with wax for good while pimping your sled with a new look.